Proposing without an engagement ring may seem like a tremendous faux pas, but for many couples it is a better alternative than potentially choosing the wrong ring or focusing more on a piece of jewelry than on the romance and commitment it is supposed to represent. 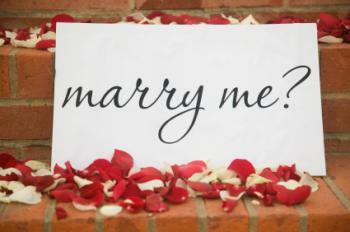 Believe it or not, it is possible to create a wonderful proposal and worry about getting the perfect ring later. There are many creative ways to propose minus a ring. Many couples prefer to spend money on their wedding or other financial obligations instead of paying the high cost of an engagement ring. Budget constraints and financial concerns are among the most common reasons that many get engaged without a ring. For many, a ring may come later and be presented at an anniversary or on a special date that is significant to the couple. If a couple is concerned about finances, this should be discussed before planning an engagement or wedding. Make sure you both are on the same page so that there are no surprises or hurt feelings. If finances are a concern, you could use a family heirloom ring, even though it won't be the official engagement ring. This shows that the bride-to-be is welcome in the family at the same time. Some men are not certain about the bride-to-be's tastes in rings, and prefer to allow her to choose her own ring after the proposal. If this is the case, then you can call local jewelers and set up personal appointments for you both to go and look at rings. You can use an empty ring box from the recipient's favorite jewelry store and promise to let her fill it with whatever ring she desires. Just be sure to present the empty box after the question has been answered to avoid confusion or the appearance of a practical joke. Another reason for proposing without a ring is that you want to design a custom ring that cannot be found at a traditional jeweler. Both the man and woman may want to give their input on the custom design and have it created to their personal tastes and preferences. After the initial proposal, you can both sit down to design the ring of your dreams. Another situation in which a proposal might occur without a ring is if a woman is proposing to a man who may not want an engagement ring. There is no set rule that the man has to be the one to propose marriage. Many women prefer to ask the question and simply forgo a ring since some men may not feel comfortable wearing one. After the proposal, some men may wish to give their bride-to-be a ring as a symbol of his commitment to her. A woman who wears little or no jewelry may only want a simple wedding ring rather than a set. She may not want to wear a formal engagement ring and would rather wait to wear a wedding ring. If this is the case, you can both look at wedding rings in advance and pick out one for the special day. If the woman does not like to wear a ring, you can propose using another type of jewelry such as earrings or a necklace if you prefer. Many other pieces of jewelry can be just as stunning and meaningful as engagement rings. Regardless of the reasons for proposing without an engagement ring, the couple must realize that the most important aspect of any marriage proposal is the couple's relationship. If the acceptance of that proposal is dependent on a piece of jewelry, the couple may be better off working out their relationship on a deeper level before making that commitment. For some couples, following a tradition of giving a ring is not important at all; the proposal and commitment to the relationship are all they want and need. A unique venue: Consider using a billboard or scoreboard or asking the question in a unique venue. Focusing on one another: If you propose without a ring, you can simply hold hands and gaze into one another's eyes instead of into a diamond's sparkle. Seeing the love and joy in each other's eyes more than makes up for the lack of a gem. A floral proposal: When asking the big question, you could also give a single rose or a bouquet of flowers as a special gesture. Presenting a celebrity ring: To add some fun to the proposal, consider using a celebrity ring replica as part of a fun, imaginative proposal. Choosing the recipient's favorite celebrity engagement ring is also meaningful, but do not try to pass such a ring off as authentic. Proposing without an engagement ring can be a difficult situation for many couples, regardless of what reason they may have for not presenting a ring as they ask and answer that important question. Many couples choose alternatives and opt to shop for the engagement ring after the event, but as long as the engagement is respected and honored by both parties, it will lead to a respectful and loving relationship.